I am sick of the heat!!! Since the first day of July through the beginning of August it’s been hot outdoors. It’s really hard to enjoy our deck that faces the south west. Our large trees are far enough from the house that we do not reap the benefit of shade until the latter part of the day. Next year we will be investing in another large umbrella and an outdoor oscillating fan. I was on a business trip recently in Longmont Colorado, which is a city next to Boulder. I was gone from Monday morning and returned Wednesday night. While I was there it was also hot and I was surprised with the humidity. I think Minnesota was even cooler. I was happy to be home and was looking forward to Chris’ home cooked meals. I had many follow up meetings so I decided to work most of the day at home. For the most part, the house was relatively cool most of the day but as Chris started cooking, I could feel the main floor start heating up. I was surprised because the only thing she was doing was par-boiling Artichokes. We planned on grilling this night. The AC was running and I noticed by 6 pm the temperature on the thermostat was 77 degrees inside! Even though we have a controllable thermostat the temperature should have dropped to around 73 degrees by now. By now Chris had everything ready and I helped bring out the food to grill. I was still uncomfortable and bothered that the temperature was so high. I decided to go down stairs to check out the furnace. As I entered the mechanical room it did not feel cold. I touched metal walls and they felt warm. I initially thought maybe the unit froze up, but not this time. I started scratching my head. What was going on?? I asked Chris if she noticed anything. She did say Monday night was warmer than usual. 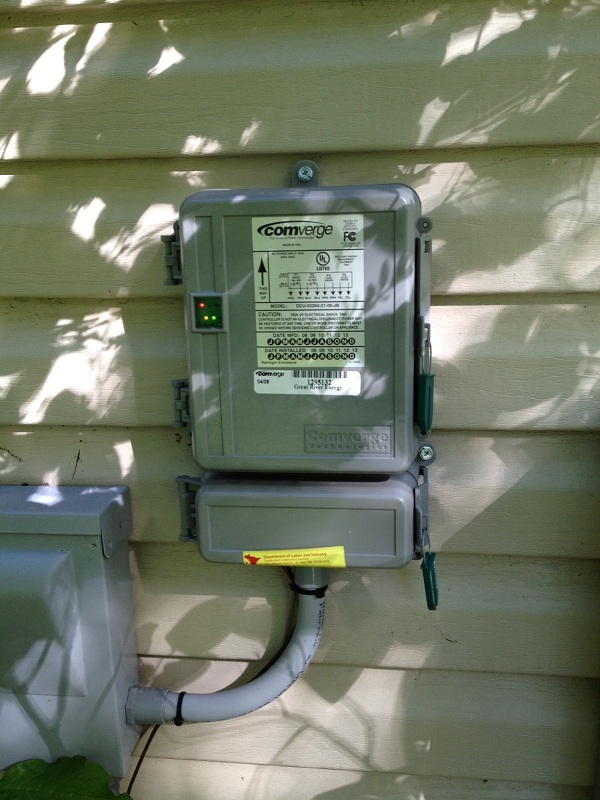 I decided I needed to flip the AC circuit breaker and see what was going on outside. I flipped the breaker and ventured out in the heat to check out the AC cooling unit. As soon as I made it to the unit it was like a slap to the face. Of course the house is warmer…. We have a “POWERNAP” AC Controlling unit. The POWERNAP unit allows our local electrical company to turn of the condensing unit during off peak hours. We have had the unit for years and this was probably the first week we really noticed the power company controlling the condenser. Now that we had resolved the problem it was time to figure out what wine to drink! Actually, I had figure it out before I troubleshot the AC problem. 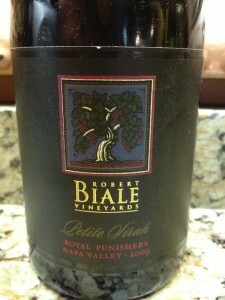 I had grabbed a bottle of 2009 Robert Biale Royal Punishers and put it into the refrigerator to cool down. 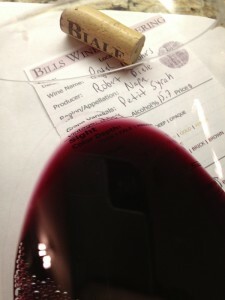 I was impressed how dark the Petite Sirah was. It was like an Inky Purple. The color depth was deep and the clarity was clear. Look how dark the wine was! 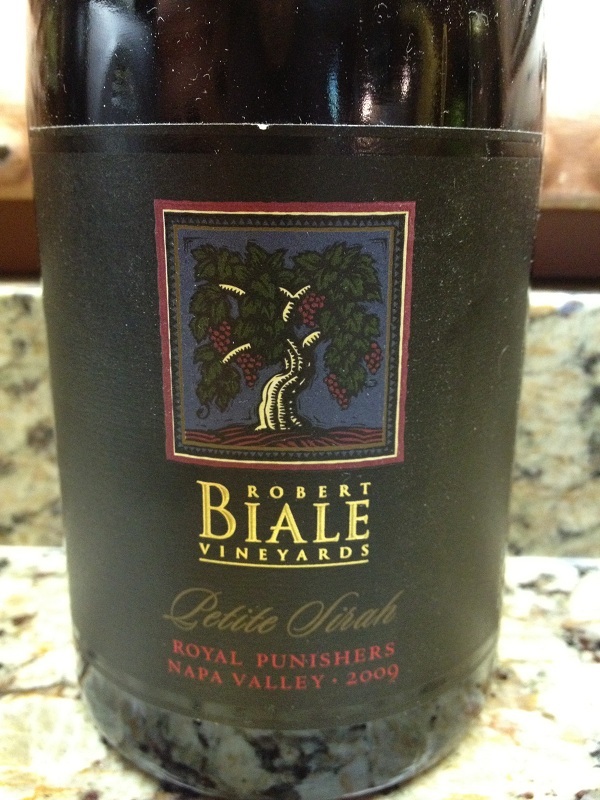 The Royal Punishers Petite Sirah was very aromatic and the development was youthful. I noted Dark Cherry and Fruit. My initial taste was very pleasing. The wine was not dry and it was full bodied. The tannins were medium and could be felt in my mid palate. It was flavorful and the finish was long. I could taste Plum, Cocoa, and maybe a hint of vanilla. We both rated the 2009 Royal Punishers Petite Sirah four glasses.